The title of this post is stolen, with adoring attribution, from a piece in the November 16, 2010 issue of Autophagy, because we couldn’t have said it better ourselves. The grouping of images from different parts of the same gel, or from different gels, fields, or exposures must be made explicit by the arrangement of the figure (i.e., using dividing lines) and in the text of the figure legend. Adjustments of brightness, contrast, or color balance are acceptable if they are applied to the whole image and as long as they do not obscure, eliminate, or misrepresent any information present in the original, including the background. Nonlinear adjustments must be disclosed in the figure legend. Manipulated images are a frequent cause of retractions, so Klionsky’s focus is understandable. He cites the Journal of Cell Biology’s rules on presenting images. Those rules were familiar to one of us, because in a past life Ivan worked with JCB managing editor Mike Rossner on an opinion in The Scientist about how they could have detected some of Woo-Suk Hwang’s human cloning fraud. That work was later retracted, of course. We would like to add a note of concern to our manuscript published last year in Autophagy (Huang Q, Shen H-M. To die or to live: The dual role of poly(ADP-ribose) polymerase-1 in autophagy and necrosis under oxidative stress and DNA damage. 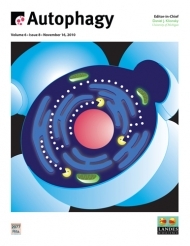 Autophagy 2009; 5:273-6). Our concern is due to the retraction of the related article, to which our article was an addendum:: : Huang Q, Wu YT, Tan HL, Ong CN, Shen HM. A novel function of poly(ADP-ribose) polymerase-1 in modulation of autophagy and necrosis under oxidative stress. Cell Death Differ 2009; 16:264-77: : The decision for the retraction is based on the discovery of some technical errors in the data, although we are still confident about the overall validity of the conclusion of the study. In other words, in case you worried about the retraction of our other paper, we stand by this one.